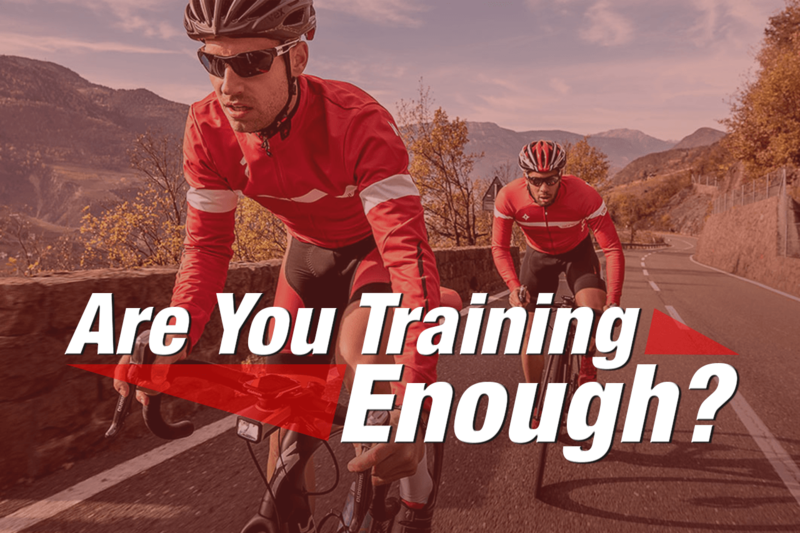 Home » Power Central » Are You Training Enough? There are no perfect ways to determine if you are training right or training enough. Besides, perfect is often the enemy of good or even great results. I have tried several methods to determine the appropriate amount of volume when building training plans. I have used simple formulas from only increasing training volume by 20% every few weeks, to published guidance on how much a given category cyclists or runner needs to train to be competitive. The utilization of Training Stress Ramp Rates and even gut feel when trying to determine how much volume I should give to an athlete have been my go to now for several years. The Performance Management Chart has been my go-to method to determine an athlete’s state of fitness and freshness for some time. There are several types of PMC’s to choose from that utilize different models to determine an athlete’s fitness from week to week, month to month and annually. All PMCs will need a measure of short and long term training stress as well as the intensity of individual workouts. Train for too long or too hard and you will overtrain and need an unexpected and unplanned downtime or worse yet don’t train enough and you won’t make the gains you desire. Before I dive into the details of what goes into a PMC we need to talk about your athletic discipline, focus, and specificity. 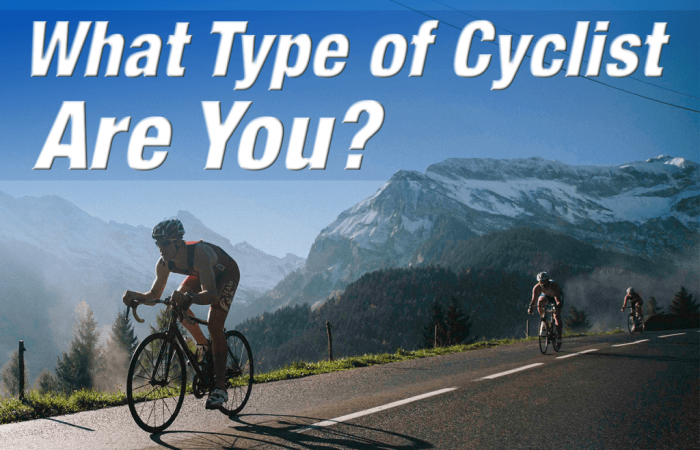 How you participate in your favorite sport recreationally and competitively should be driving you to train specifically for your favorite sport. Without going into every possible endurance sport and sub-discipline I am going to streamline what I mean by specificity. If you are a 5K runner you are not likely to use rowing in an effort to improve your running. If you are a Stage Racer you are not going to be training 30-minutes a day and expecting to do well. If you are a multisport athlete you are not going to go ice climbing to gain an edge over your competition. Yes, these examples are meant to be tongue in cheek, however, I have heard and read all sorts of suggestion from well-meaning athletes on how to become better at a particular discipline that wasn’t much better than my silly examples. In the table, I am calling the Training Factors Specificity Rankings. You will find Training Factors in the top row in whites text. In the far left column, you will find various cycling related racing disciplines in bold text. For those of you not racing but participating in shorter group rides on roads should look to road racing, to those recreationally riding mountain bikes should look at MTB XC, for those that are riding in centuries should also look at road racing. Fields with no X present means there is little to no need to work within that training factor. For the fields with 4 X’s present should consider this training factor a priority in your training for your discipline. While I won’t be going into detail describing exactly how many hours should be spent daily for competitive cyclists and recreational cyclists. I have learned some pretty solid lessons as to what does and doesn’t work for the athletes I have coached. I would add that the total annual and weekly hours should include auxiliary training such as strength training in the gym or at home. While I also prescribe a flexibility program for most cyclists I coach we do not count that work towards total training volume. As a coach one my go to tools is the Performance management Chart mentioned earlier in this article. With the PMC I can determine if a given workout was executed properly based on the given intensity and stress accumulated for that workout. I can also discover how fast the training stress is accumulating. The accumulation of too much training stress in too short a period of time can lead to wooden legs or worse, injury and burnout. I can also track the long-term progress of training stress in an effort to prepare an athlete for their priority race or event. It still not perfect as I have learned some of the general rules behind the PMC haven’t always been correct for some of my athletes. Some can accumulate more training stress than is normally directed and others can’t reach prescribed training stress levels before catching a cold or feeling overworked. In either case, its still works as an early warning device for athletes. While I do use the PMC and various models associated with the PMC in the application Golden Cheetah I have come to lean on the PMC available to me at TrainingPeaks.com along with their ramp rate diagrams. In the next diagram, you will see an athlete’s TrainingPeaks.com PMC for the entire year. This PMC shows a slow boil leading to the CX Season. In the above annual PMC we have the daily training stress (dTSS) in red dots, Fitness or Chronic Training Load (CTL) in the blue line, fatigue or acute training load(ATL) in in the pink line, daily intensity factor (dIF) in blue dots and finally the athlete’s form or training stress balance (TSB) in the yellow line. These acronyms are specific to TrainingPeaks.com and WKO products. Applications like Golden Cheetah do use these measures as well as others to determine this information. When you see your CTL rise you are gaining fitness, when you see your TSB drop into negative territory you are working towards fitness. However drop below -25 to -30 TSB for too long and you become overtrained. Sit on a positive TSB number for too long and you are becoming detrained. Have a TSB in the low positive territory of 5-20 and you are developing form or freshness along with your fitness. 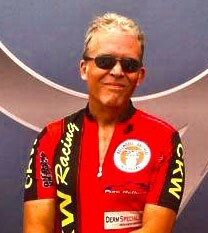 If you are involved in more than one sport such as triathletes you will want a separate PMC for each sport! While I do this I also have a PMC for my multisport athletes that lets me see total training stress accumulation too. Most athletes have a tough time maintaining a CTL value of 125 for very long. In the terms of periodization of training the point where an athlete gains a CTL score of 100-135 is often what occurs just before a taper for an athletes priority race or event. In the fitness ramp rate chart from TrainingPeaks.com, this athlete is showing that their current CTL is at 106 and their TSB -20. I know from prior experience with this athlete they have a very strong tolerance to fatigue. However, I will need to back off their intensity in the coming weeks to prepare for their Peak Cyclocross race. 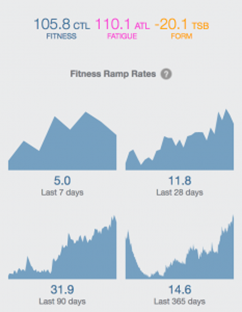 The number to pay attention to in the chart is the last 7 days Fitness Ramp Rate. Even though this athlete can tolerate more fatigue than most I have coached he is like many in the fact that he can’t tolerate more that a score of 6-7 on his 7-day ramp rate. When you see a negative number in your 7 day ramp rate you are not gaining fitness you are gaining form. If you have been training and racing for more than a few years, by now you probably know when you are cooked and need a break. 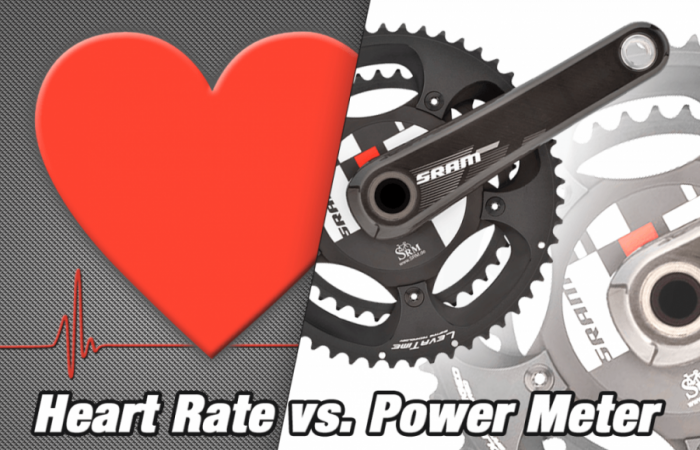 The data we collect from our sensors and power meters don’t always tell the full story. Mental fatigue, life stress, and emotional stress can all play a part in how you perform and of course how you feel. Do not discount these subjective and often intangible scores as it can lead to overtraining, despair and burnout from your favorite sport. 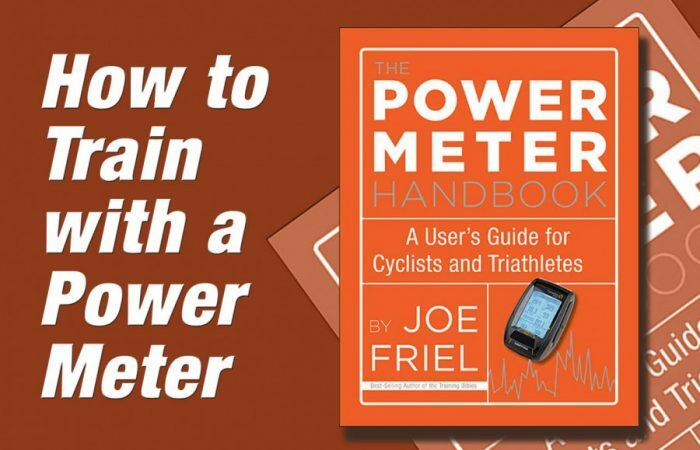 I hope you found this helpful I know it’s a lot to take in and full of acronyms but that is part of learning how to use your power meter and the information it can provide you. If you still don’t get the concepts behind the PMC, TSS, IF, ATL, CTL and TSB don’t fear. The more you read, look at your data and try to apply it, the more it will make sense.